Brace for a delectable journey as we take you on the trail of some of the best Southeast Asia street food you can possibly have. On a late May evening in 2016, US President Barack Obama and celebrity chef Anthony Bourdain sat down on blue plastic stools at Bun Cha Huong Lien restaurant in Hanoi for a traditional Vietnamese meal. Bourdain “walked him through” the Bun Cha ritual, showing him how to drop vermicelli rice noodles, condiments and spring rolls into a bowl of sweet, yellow broth loaded with charcoal-grilled pork patties and pork slices. The President sportingly “slurped” down the noodles, proclaiming the dish as “killer”. That’s Southeast Asian food for you. There’s nothing pretentious about it. It’s simple, yet complicated in its use of contrasting flavors and textures — sweet and sour, pungent and astringent, soft and crunchy. It’s fresh as hell and bursting with flavors — think lemongrass, galangal, coconut, papaya, garlic, sesame, cilantro. All rounded up by umami, the rich, savory taste lent by soy sauce, fish sauce and other fermented foods. 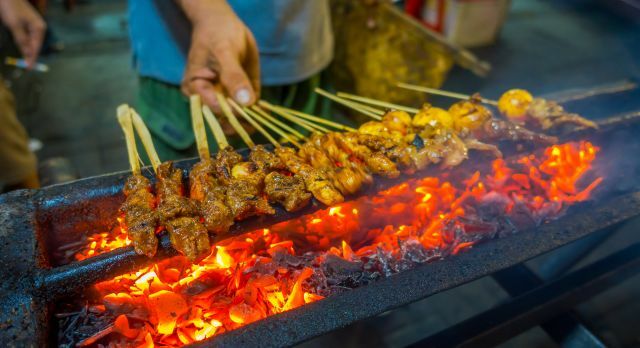 Hop on to a gastronomic trail with us as we tell you where you can find the best street food during your travels to Southeast Asia. If you had just one night in Bangkok, you’d do well to hop into a taxi or a tuk-tuk and head to Chinatown or Yaowarat, which offers some of the best Thai food. Try fiery Pad Thai noodles tossed up with chilies, tofu, tamarind and fish sauce by a Bangkok street vendor. Then get off the spice trip with a sweet, cooling dessert made of coconut milk poured over ice and jellied water chestnuts. If you’re still not satiated, make your way to Charoen Krung-Bangrak and try the boat noodles right outside Saphan Taksin BTS station. Not for the faint-hearted, boat noodles take in pork and beef in a rich broth flavored with dark soy sauce, pickled bean curd, cow or pig’s blood, served with meatballs and pig’s liver. You could also walk the narrow lanes of the Old City (Rattanakosin) in Bangkok for the best Pad Thai at Pad Thai Thip Samai or head to Silom and Sathorn roads for some Khao Soi (curried egg noodles in coconut milk curry with braised beef or chicken). 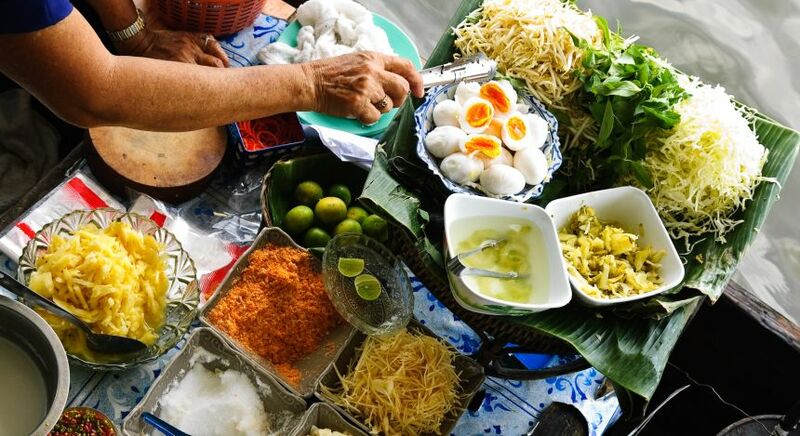 Pack in a visit to Chiang Mai to try its Lanna fare — fresh, light and healthy Thai food cooked from recipes honed over generations. Across the Chang Puak Gate, at a popular stall, a woman in a cowboy hat slow roasts a mean pork leg. 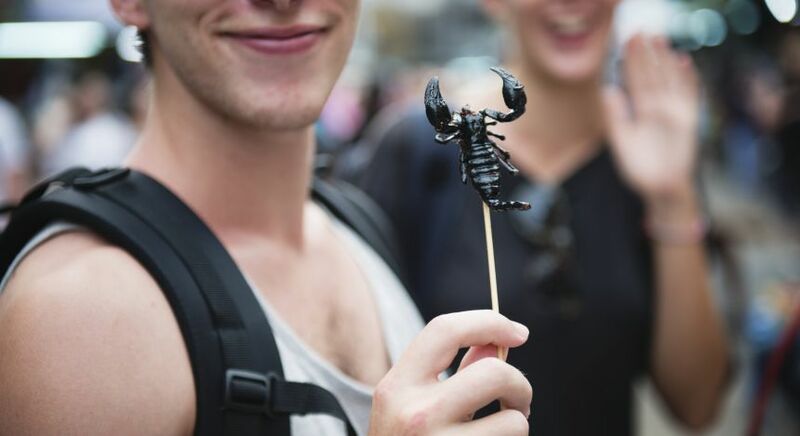 If you’re feeling adventurous, this is also the place to try all kinds of creepy-crawlies, piled high on big platters. While Thai food is known for its heat, Vietnamese cuisine is known for its freshness. Not a place for curry lovers, this; the noodle dishes and stir-fries here are light, citrusy, and loaded with herbs. Two of the most popular exports from Vietnam — Pho and Banh Mie — draw on French colonial influences. Pho is a slow-cooked broth infused with star anise ladled over thinly sliced meat, vegetables, and rice noodles, and topped with basil, mint, bean sprouts, chilies, and fried scallions. Banh Mi is a crusty baguette roll stuffed with pickled radish and carrot, luncheon meat, pâté, mayonnaise, cilantro, and freshly pounded chilies. Try the Banh Mi at a food stall called Banh Mi 37 Nguyen Trai in Ho Chi Minh City. In Hanoi, you can have the best Pho at 49 Bat Dan street and 10 Ly Quoc Su street. 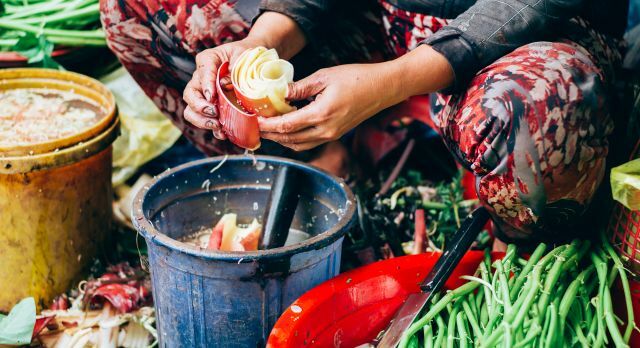 For an authentic Hanoi food experience, walk around — or hop onto a xe om (a motorbike taxi) or cyclo (a bicycle rickshaw) — the city, stopping by nondescript hole-in-the-wall joints selling Vietnamese favorites. Crouching on plastic stools in the back alleys of Hanoi’s Old Quarter, you will discover delights such as Bun Oc (a tomato-flavored broth with snails, scallions, cilantro, mint, basil) and Quan Oc (snails cooked in ginger, lemongrass, and kaffir lime leaves). Ask your Enchanting Travels consultant to organize a visit to Hoi An and go on an evening street food tour through its intricate maze of alleyways. 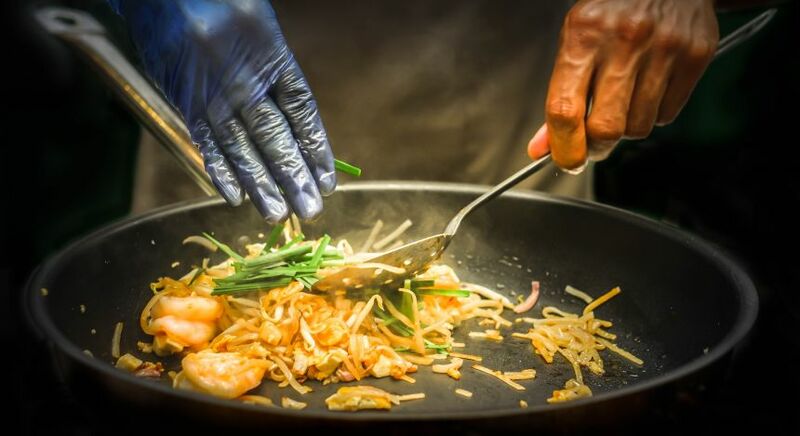 Visit generations-old street food joints serving traditional Vietnamese food like white rose (shrimp dumpling), banana sweet soup and coconut pancakes. Walk through Mangga Dua morning market in Jakarta and start your day with Bubur Ayam — the hearty Indonesian chicken conjee (rice porridge) topped with chicken broth and a sweet-salty soy sauce, peanuts, fried crackers, fried tofu strips and shredded chicken. Walk a bit further to discover a colorful display of Nasi Rames — a dish of nasi (rice) heaped on a plate served with small portions of spicy meat, squid, mussels, chicken feet, tempeh (a fermented soy cake), vegetables and peanuts. 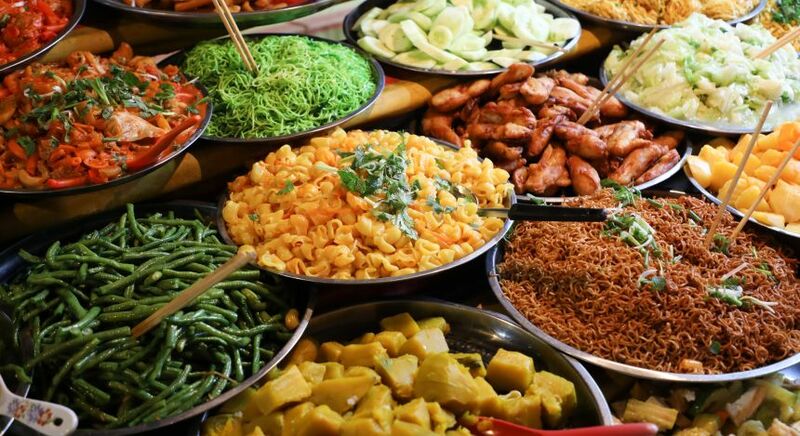 Jakarta’s cuisine has been influenced hugely by the Betawi ethnic group, including Indonesian recipes like Nasi Uduk (steamed rice cooked in coconut milk) and a Betawi variant of Gado Gado, a salad made with blanched vegetables, hard-boiled eggs, boiled potato, fried tofu and tempeh, and lontong (rice wrapped in a banana leaf), topped with a sweet peanut sauce. For the best Gado Gado, head to Gado Gado Bon Bin Cikini, run since the early 1960s by an elderly couple. Don’t forget Nasi Goreng, the unofficial national dish of Indonesia. Roadside chefs make quite a display of tossing up the spicy fried rice — layering boiled rice and meat cooked to succulent perfection with curry powder and chillies, creating “waves” of kecap (a sweet and thick soy sauce) on the rice before mixing it all up, and garnishing it with pickles and sambal (a condiment made from chilli, fermented shrimp paste, lime, sugar and salt). Try this national favorite at Nasi Goreng Kambing Kebon Sirih in Jakarta. While planning your itinerary, get your Enchanting Travels consultant to book you a half-day private cooking class with a local family. Visit host Dewa and his wife, Jero, at their charming house. Assist Dewa in picking vegetables, spices, and herbs from his organic garden. You can then help Jero cook (and eat) a traditional Indonesian meal. Sticky rice is the essence of Lao cuisine, so much so that the Lao people call themselves “luk khao niaow” or “the children of sticky rice”! Try the Khao Lam Bamboo Sticky Rice — white or black sticky rice, steamed, mixed with coconut cream and red or black beans, and stuffed into hollow bamboo tubes and roasted till the ingredients fuse together into a perfectly sweet and filling treat. 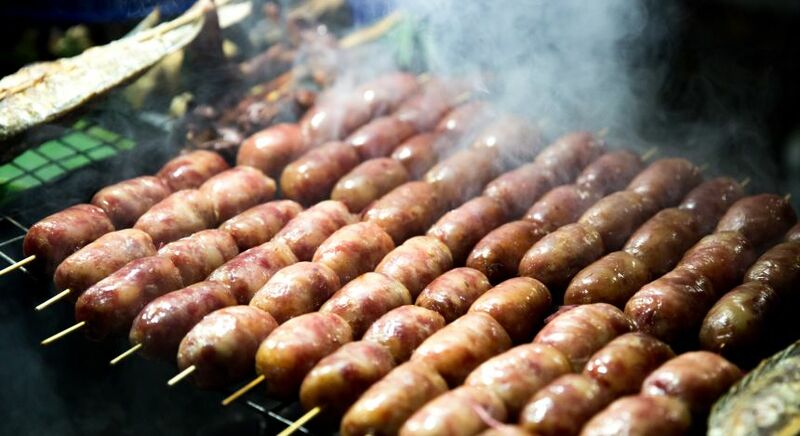 In the streets of capital city Vientiane, sample an array of street food including grilled meats, Cheun Yaw (crispy fried spring rolls stuffed with pork, shallots, herbs and veggies), pancakes filled with meats, fruit or chocolate, and Feu, a beef and noodle soup that’s the Laotian equivalent of Pho. For authentic Lao snacks, head over to Ban Haysoke for some Sai Oua or Laos sausage, made of pork meat, seasoned with lime leaf, galangal, lemongrass, cilantro, shallots, and fish sauce. One of the most charming things to do in Laos is taking a stroll along the beautiful Mekong in the evening. 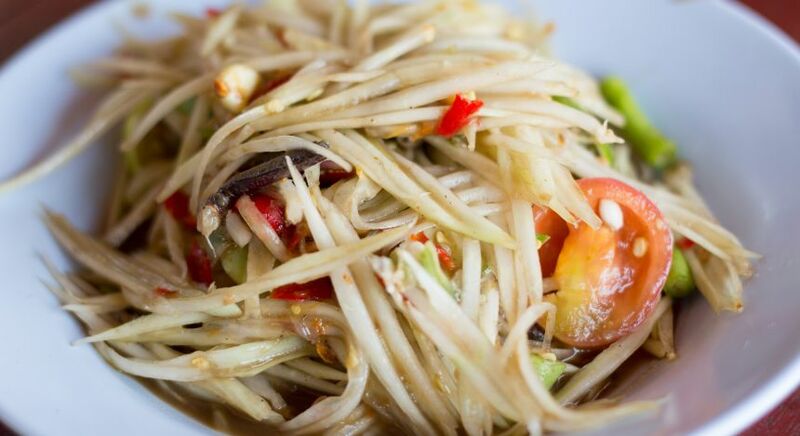 Shop for clothes and trinkets at a night bazaar while you dig into Som Tam, a refreshing salad made with shredded raw papaya, meat or fish, dressed up with chilies, sour lime, fish sauce, salt, and sugar. Make sure you include a tour of the famous night market of Luang Prabang in northern Laos. Walk past busy shops displaying a colorful array of local merchandise and turn into smaller alleyways where mouthwatering food buffets and local snacks await. 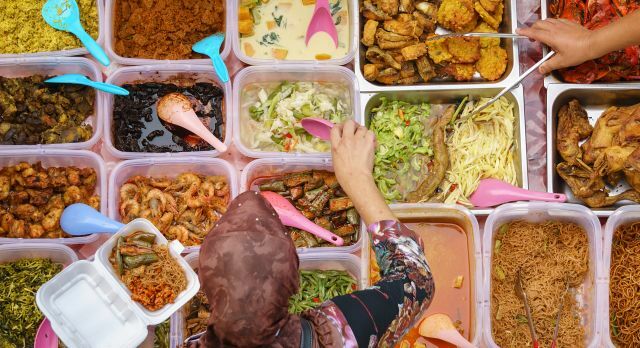 As you step into Kuala Lumpur (KL for short), get ready for an epicurean adventure at the juncture of three culinary traditions — Malay, Chinese and Indian. Malaysian recipes are a heady amalgamation of the fragrance of Indian curry leaves, tartness of tamarind, invigorating freshness of lemongrass and galangal, and sweet creaminess of coconut milk, with some pandan leaves (Asian vanilla) in for good measure. 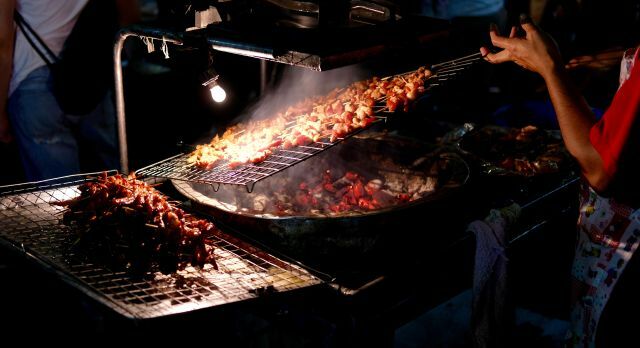 Let locals be your guides at Malaysia’s hawker centers — open-air food complexes with an artisanal feel. Try Malaysia’s signature dish, Nasi Lemak — fragrant rice cooked with fatty coconut milk, served with a hard-boiled egg, cucumber, peanuts, a spicy sambal, dried anchovies and fried chicken. Cool off a yummy local dessert made of shaved ice topped with palm sugar, pandan leaf jelly, coconut milk and red beans. If you’ve got Malay Chinese on your mind, head for Madras Lane Petaling Street in Kuala Lumpur’s bustling Chinatown. The most popular dishes here are Chee Cheong Fun (rice noodle rolls filled with shrimp, pork, beef or vegetables) and curry laksa — a rich-and-spicy coconut curry stew with rice noodles, prawns, chicken, tofu puffs and fish balls, served with mint and fried shallots. 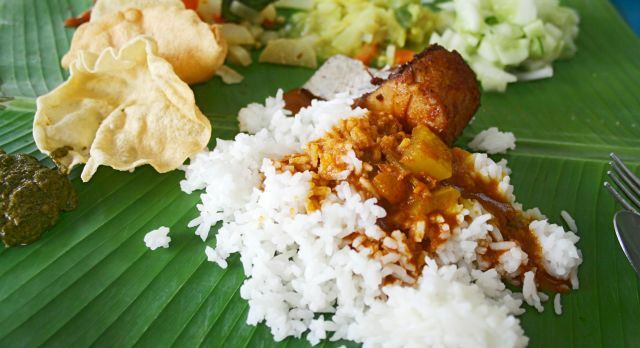 For an authentic Indian banana leaf meal, Aunty Manju’s, Devi’s Corner or Restoran Nirwana Maju in KL’s Klanng Valley are your best bets. Dig in with bare hands into spicy chicken, squid, prawn, mutton and crab curries, varuval (spicy dry-fried chicken), assorted vegetables, deep fried fish and poppadoms served on a mound of steamed rice. 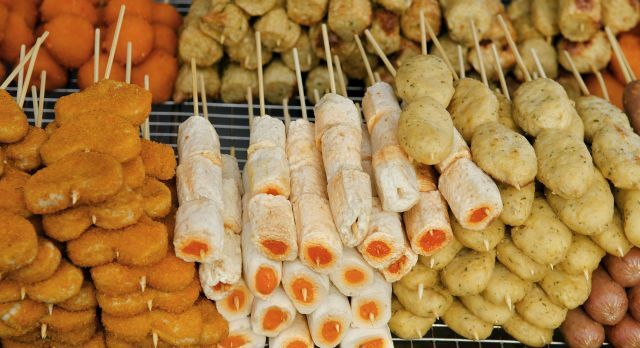 Your Enchanting Travels consultant will plan a half-day Penang street food tour for you during your Malaysia tour. Visit the quaint suburb of Ayer Hitam to savor Malaysia’s beloved curry laksa, or try the oyster omelet at the Town Coffee Shop, where the eggs are fried to a crisp, contrasting with the soft, squishy oysters. 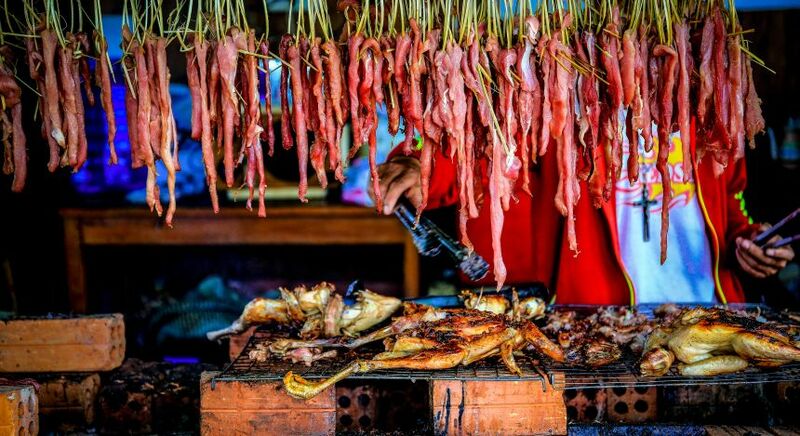 Plan a gastronomic adventure in the streets and busy bazaars of Southeast Asia. Our destination experts are happy to help you set out on your food trail.